On my recent trip to Australia, I heard a quote that really stuck with me: “If you only visit two continents in your lifetime, visit Africa – twice” (-R. Elliot). As I have visited southern Africa four times in my eighteen years and plan to return soon, I wholeheartedly agree with this statement. Something about its sprawling savanna where countless animals can be observed going about their daily routines, vibrant cities like Cape Town and Victoria Falls, and the wonderful people who call it home, continues to draw travelers back for multiple visits. 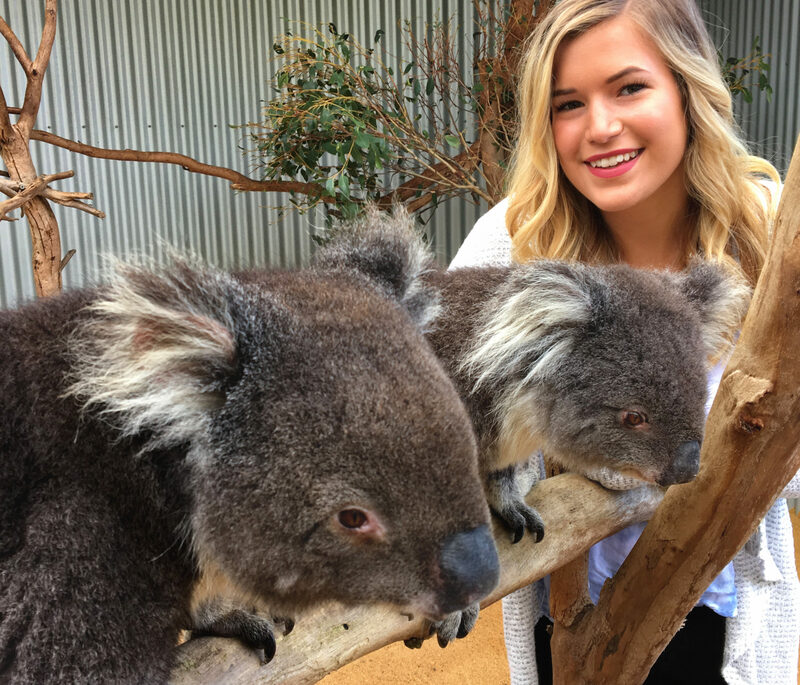 Since my last visit two summers ago, I have been dying to go back, and after my first trip to Australia, I almost feel like I did! Though they are quite different geographically and politically, both continents give me a taste of the wildlife and city life that I crave the most while traveling. I spent 18 days in Australia with my parents, Craig and Kay, and my sister, Sydney! On our recent blog post, we each wrote about our trip highlights. We spent eight nights in South Australia, split between the Barossa Valley wine region, Flinders Ranges, and my personal favorite: Kangaroo Island. I don’t feel like it’s an exaggeration to say we saw a thousand kangaroos, wallabies, and wallaroos combined. Next we visited Tasmania (which was freezing, but after enduring ten Minnesota winters, we were able to power through it) and saw the Tasmanian devils! Lastly, we spent time with extended family in Sydney, a city I fell in love with. I could not resist comparing our experience to those I have had in Africa, and there were many striking similarities and unique differences that stood out. There’s not a lot that can beat the adrenaline rush of walking through the lands that lions, leopards, rhinos, hippos, and elephants call home. However, precautions must be taken to avoid sneaking up on these animals: walking safaris must be taken during the daytime and accompanied by a guide. Having this mindset, being on safari in the Outback was a completely new experience: we could walk freely and fearlessly during any hours of the day! There are no large predators besides dingoes, which are unfortunately becoming scarce as they are seen as a nuisance to farmers. Kangaroos could definitely do some damage if they wanted to, but they don’t. We learned a new game of “red light, green light,” when approaching kangaroos, where you stop walking if they look at you or hop away, and continue if they keep grazing. Throughout Flinders Ranges and Kangaroo Island, we were able to observe kangaroos, wallaroos, wallabies, koalas, wombats, echidnas, possums and many birds in the wild! Every animal we encountered was very peaceful and undisturbed by humans, which I can’t say about Africa, where I have been charged by elephants and made very intense eye contact with some very big cats! However, what is amazing to me about the strong presence of predators in Africa is seeing the “circle of life” in action, where in Australia the only kill we saw was roadkill. Seeing wildlife is my absolute favorite part of traveling, and in each destination I could watch the animals interact for hours and never get bored. I never thought I’d love any city in the world as much as Cape Town, but Sydney quickly rivaled my previous favorite. Coastal cities like Miami, Honolulu, New York, Seattle and Charleston are always a top choice for me, and Sydney takes advantage of its location in a way I’ve never seen before: its metro system incorporates ferry rides! You simply scan the same card used for light rail transportation at the metro station and hop on the next ferry to take you to all of the city’s harbor-side destinations. The beach suburbs and waterfront streets in both cities are very similar, but one highlight in Cape Town for me was spotting penguins at Boulders Beach. On our last day in Sydney, we visited Manly beach, taking a short hike to enjoy the scenery from a higher vantage point. There were so many restaurants that I (possibly the world’s pickiest vegan) could hardly decide! Another perk of Sydney was feeling even safer than I do at home; we were able to stroll through city streets and public parks at night without fear, and there is little need for residents to even lock the front door. As for choosing a favorite between the two, I might just have to visit both again to decide! This trip was my first experience with wine tasting, as Australia’s legal drinking age is eighteen. I was blown away by the gorgeous vineyards in Barossa Valley, but mostly because our first kangaroo experience was actually playing with them at a winery that cared for orphaned ‘roos! This made Whistler Wines a standout favorite, but we passed by several others in both Barossa and Clare Valley that could have made for a great experience if we had more time. The time I have spent in the Cape Winelands has been focused around dining, which is exceptional there, and spending time with family. Both regions offer unbelievable landscapes and a wide variety of wine tasting, winemaking tours, restaurants and walking trails, but a surprise kangaroo play date could only happen in Australia.